Offer mealworms, nuts, and fruit to your feathered friends in a convenient way using this Pine Tree Farms Le Petit Mealworm Banquet Seed Cake. Some birds, such as waxwings and warblers, prefer mealworms to traditional seed, and this cake makes feeding such a treat simple. A gelatin binding keeps the nuts, fruit, and mealworms in its compact, square form, perfect for placing in standard suet or seed cake feeders. This blend of ingredients provides birds the energy they need to thrive, and the unit may also rest on a tray or platform feeder for several of your feathered friends to enjoy it. Supply bluebirds and thrushes with mealworms in a new way using this Le Petit Mealworm Banquet Seed Cake. Made in the USA. 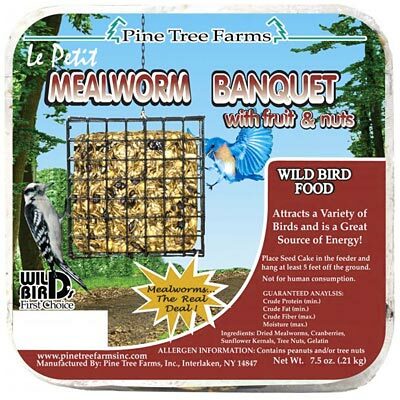 Note: This case pack includes 12 of the Pine Tree Farms Le Petit Mealworm Banquet Seed Cakes, 7.5 ounces each.